↑ ୧.୦ ୧.୧ ୧.୨ "Parasites - Toxoplasmosis (Toxoplasma infection) Epidemiology & Risk Factors". March 26, 2015. Retrieved 22 August 2015. ↑ Hunter, CA; Sibley, LD (November 2012). "Modulation of innate immunity by Toxoplasma gondii virulence effectors". Nature Reviews Microbiology. 10 (11): 766–78. doi:10.1038/nrmicro2858. PMID 23070557. ↑ ୩.୦ ୩.୧ "Parasites - Toxoplasmosis (Toxoplasma infection) Disease". July 10, 2014. Retrieved 22 August 2015. ↑ "Parasites - Toxoplasmosis (Toxoplasma infection) Biology". March 17, 2015. Retrieved 22 August 2015. ↑ "Parasites - Toxoplasmosis (Toxoplasma infection) Diagnosis". January 10, 2013. Retrieved 22 August 2015. ↑ "Parasites - Toxoplasmosis (Toxoplasma infection) Prevention & Control". January 10, 2013. Retrieved 22 August 2015. ↑ "Parasites - Toxoplasmosis (Toxoplasma infection) Resources for Health Professionals". April 14, 2014. Retrieved 22 August 2015. ↑ Flegr J, Prandota J, Sovičková M, Israili ZH (March 2014). "Toxoplasmosis--a global threat. Correlation of latent toxoplasmosis with specific disease burden in a set of 88 countries". PLoS ONE. 9 (3): e90203. doi:10.1371/journal.pone.0090203. PMC 3963851. PMID 24662942. 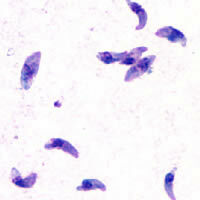 Toxoplasmosis is becoming a global health hazard as it infects 30-50% of the world human population. ↑ Jones JL, Parise ME, Fiore AE (2014). "Neglected parasitic infections in the United States: toxoplasmosis". Am. J. Trop. Med. Hyg. 90 (5): 794–9. doi:10.4269/ajtmh.13-0722. PMC 4015566. PMID 24808246. ↑ Torgerson, PR; Mastroiacovo, P (1 July 2013). "The global burden of congenital toxoplasmosis: a systematic review". Bulletin of the World Health Organization. 91 (7): 501–8. doi:10.2471/blt.12.111732. PMID 23825877. ↑ Ferguson DJ (2009). "Toxoplasma gondii: 1908-2008, homage to Nicolle, Manceaux and Splendore". Memórias Do Instituto Oswaldo Cruz. 104 (2): 133–48. doi:10.1590/S0074-02762009000200003. PMID 19430635.